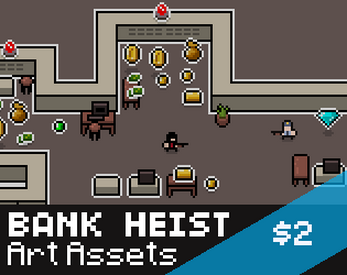 Done in a pixel art style this art asset pack includes various tiles, objects, items and characters well suited for a bank heist inspired game! Whether a shooter, daring escape or all of the above get to work and make something cool with these sprites! - various loot.. gems, diamonds, gold bars, paper money, money bag etc! - various tiles/objects suited for a bank theme, but could easily be used otherwise.. If you want to see the art in action check out my ludum dare entry here!